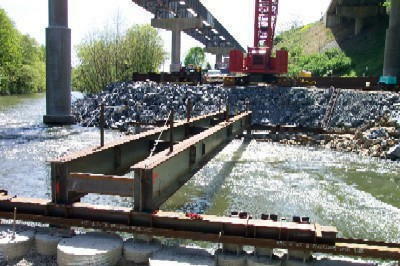 Demolition and reconstruction of northbound and southbound Interstate Route 81 bridges in Lebanon County, Pennsylvania required contractor equipment access for across the Swatara Creek along the environmentally sensitive Appalachian Trail. Peirce Engineering designed a temporary bridge, 30 feet wide by 74 feet long, to allow creek crossing for a 700,000 lb. Manitowoc 2250 crawler crane or two lanes of HS25 truck loading. The bridge components included W36 girders with a timber mat bridge deck and timber mat backwalls. The bridge abutments included foundation piles which were driven to bedrock and were then encased by tangent, concrete-filled, corrugated metal pipes to retain the approach causeway embankments.